I recently replaced the US keyboard on my Thinkpad X200, with one that is a mixed English / Chinese keyboard (An example image of it can be seen here). 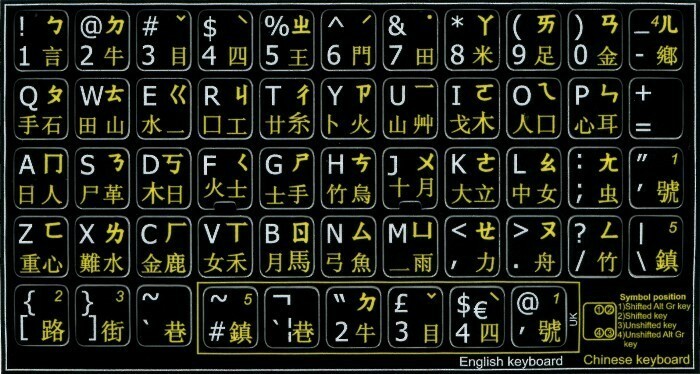 Currently it is functioning as an impeccable replacement for my US keyboard, however, I am wondering how to set up my computer to be able to type the Chinese glyphs as well. I am not looking for the ability to type Chinese using pinyin, I am looking for a method of typing the glyphs appearing on my keys. I assume that this uses perhaps the alt-gr or Fn key in combination with another key (Which, I just noticed, my keyboard does not have! ), this obviously does not currently work, however. So far I have looked at the keyboard geometry files, but it does not appear that there is a geometry file for my keyboard (there's a generic 'thinkpad' one, which contains 'common', 'us', 'intl', '60', none of which seem to cover my specific variant). I tried using some of the commands available on the Arch Linux wiki page for keyboard configuration, but they are SystemD-centric and therefore do not work on Alpine Linux. EDIT: After some further digging I noticed that the 'cn' layout appears to be approximately what I want. However, after I set it using xkbmap (specifically setxbkmap -model thnkpad -layout cn) and attempting to type the keys (with various modifiers applied), nothing happens. Browse other questions tagged keyboard-layout thinkpad input-method alpine-linux or ask your own question. How to add keys to keyboard layout in Xfce?